If you are a regular reader here, you may remember an article written about the many dangers and perils of the winter holiday season. Unfortunately, these same problems arise during the close of winter and early spring. The next festive event that threatens the health of your pets is Easter. 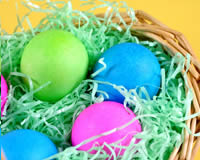 While it may often seem like a less extravagant occasion, many households with children celebrate the day with baskets, treats, chocolate eggs and the mysterious Easter Bunny. While children revel in the joy of the egg hunts and the sweets, your pets unfortunately have access to some pretty dangerous stuff. Chocolate is poisonous to our pets and especially to dogs. Plastic Easter grass is extremely harmful when eaten by our pets. Many internal injuries occur each year because our dogs and cats eat it, which gets caught in and can lacerate their internal organs. Other tasty sugary treats can be dangerous for our pets, it’s best to not risk injury and keep them away. Also, when you’re young one of the biggest excitements of Easter is taking part in an Easter egg hunt. These will often happen in the home or the backyard so it is important to be careful when when it comes to any small treats or chocolate eggs. Make sure that the Easter Bunny doesn’t leave them where pets can find them or leave any behind to be eaten later! As always, make sure you know the contact details of your nearest Emergency Veterinary Clinic because you never know what surprises life may bring.